The Chicago Blackhawks are one of the NHL’s most legendary franchises, with everything from their postseason success to the great players that have donned their famous jersey factoring into that distinction. “We didn’t want history to influence our decisions. The Toronto Maple Leafs and Montreal Canadiens sit outside the top 10 for that reason. Ranking all the Original Six 1-6 is boring, predictable and doesn’t accomplish what we wanted to do here: reward the best logos, not the longest history. 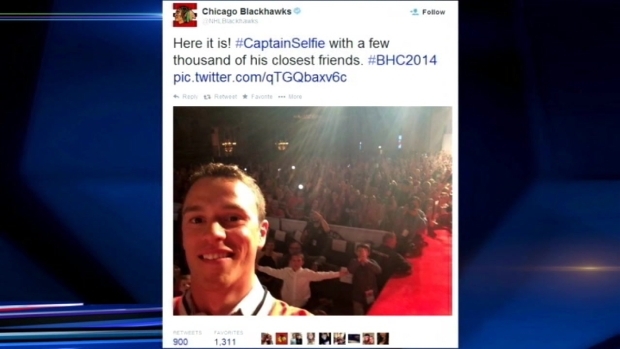 "Captain Serious" Tranforms Into "Captain Selfie"
Jonathon Toews takes massive selfie at Blackhawks Convention. Before we get into other elements of the story, it has to be pointed out that The Hockey News mentioned the way the Blackhawks show respect toward Native Americans, a point emphasized by David Haugh in a Chicago Tribune column last fall. That piece discussed how team president John McDonough and others are in constant contact with various tribes, and that outreach clearly hasn’t gone unnoticed. Outside of that part of the story, the rest of the article is full of the rich and colorful history of the team’s logo. Whether it was the original black and white engraving the team adopted in 1926 when they were known as the Black Hawks, or any of the other iterations that followed, it’s fascinating to see the evolution of the logo through the years. The team has a rich and colorful history, and these symbols certainly express that. In case you were curious, the Arizona Coyotes, St. Louis Blues, Detroit Red Wings and Buffalo Sabres round out the top five in the countdown. The Carolina Hurricanes have the distinction of finishing in last place.